Home › All Things Motorcycle › Countersteering Will Save Your Life! Getting a big (or small) motorcycle to turn requires more than just body weight. It’s hard to imagine that so many so called “experienced” riders either fail to understand the importance of countersteering or fail to recognize that countersteering is how motorcycle really turns. A motorcycle turns by leaning. Once the bike is banked over, the geometry of the chassis, as well as the rounded profile of the tires and hard-to-describe forces cause the machine to arc around the curve. 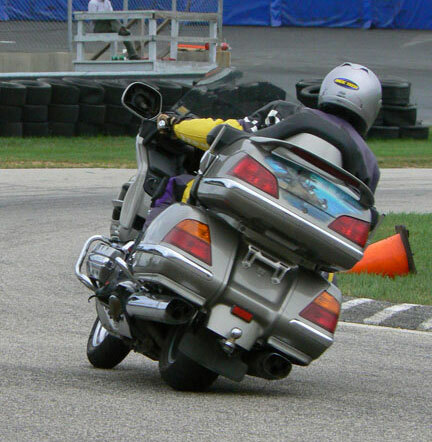 So, to turn a bike you must get the motorcycle to go from upright to leaned…precisely and efficiently. 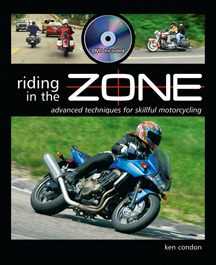 A lot of riders believe that they are able to maneuver their motorcycle by simply leaning their body or by looking into the turn. While these are helpful techniques for assisting the bike to turn, they alone cannot effectively cause a 500+ pound machine to change direction. “Yeah, but I can turn my bike without countersteering.” Um, not really. Sure, you can cause the bike to drift into a turn, but that’s not what can be called “turning”. Also, consider that most people who don’t think they are countersteering really are, they just don’t know it. Pay close attention the next time you are making any sort of turn and notice how you put a slight amount of pressure on the inside handlebar. In case you don’t already know, THE most effective way to get a motorcycle to go from upright to leaned is to introduce handlebar inputs. By pressing forward (and to a lesser degree, down) on the handlebar on the side that you want to turn, you essentially unbalance the bike so that it “falls” into a lean. Press on the right handlebar to initiate a lean to the right and press on the left handlebar to turn left. Got it? You can enhance this effect by also simultaneously pulling on the other handlebar. This is how racers achieve quick changes in direction in chicanes on the racetrack. Once the bike is leaned, then the front tire will steer slightly into the direction of the turn. You must relax your arms to let this natural balancing effect occur otherwise it will feel as if the motorcycle is not able to maintain the cornering path. Press, and then relax. Countersteering is used whenever you need to change direction. This applies to basic cornering maneuvers, as well as evasive maneuvers, such as swerving. It’s also important to be able to countersteer with authority when a corner suddenly tightens more than you expected, or when you approach a tight corner at a too-fast speed. Not being able to get your motorcycle turned quickly will eventually result in an off-road excursion or collision with an oncoming car or a guardrail. Seriously! If this makes no sense to you, then it’s time to practice. Take a look at the video clip below from the RITZ DVD for more information on countersteering and to see some drills that will help you master countersteering. Read this article that Ken wrote for Motorcyclist Magazine about countersteering. Add to the list in the comment section below. 5 Habits you need to fix, NOW! Push right, lean right, turn right. Those are all relating to the bike? What should your body position be? Leaning in the opposite direction to counter balance? Im getting a Kawasaki Ninja ZX6R, but this whole countersteering thing worries me, its been a while since I rode, and I never heard of countersteering, maybe im just overthinking it, but i also heard it comes naturally like on a bicycle. Is that true, I cant remember because how long its been since I rode. The risk of even mentioning countersteering is that it can become a source of concern. No worries. It does come naturally. But when you are conscious of it, then you are in more control. Go ride, but become more aware of what you’re doing when you initiate a turn (lean). You’ll soon understand. + When I first read about countersteering I watched several YouTube videos focused on front tire movement to “see” countersteering and its outcome. That helped me “get it”. Transferring this to the bike was a lot simpler, too. I got to see countersteering being used at Phillips Island (MotoGP) courtesy of the amazing camera work for BeIN Sports this past weekend, too. “To turn right, push right” is the easiest way to teach countersteering. The underlying principle is harder to grasp – when you push the right handlebar forward, you are steering to the left. In the old days we taught “to turn right, steer left”, which proved confusing and unnatural to some people. So “to turn right, push right” is the way it’s taught now, with good reason. But understand that “to turn right, push right” and “to turn right, steer left” are the same thing. Which “old days” are you referring to? 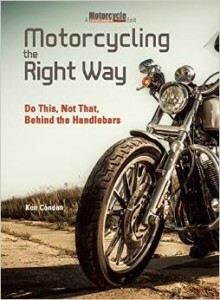 The countersteering teaching method and word phrasing of “Push Right, Go Right” (which quickly evolved to “Press Right, Go Right” and later to “Press Right, Lean Right, Go Right”) has been used in organized rider education since 1979 & 1980 when two magazine articles publicized it. My riding buddy and I disagree on the affects and impacts of counter steering and we’re turning to you and your expert staff to enlighten us. As a backdrop, years ago he crashed his ZX-11 with my daughter on the back (he had good tread on a set of soft rubber track tires). After cresting a “blind” hill on a two-lane country road at 80+ MPH, he had to negotiate a negative camber left side curve that had sand on the road surface. His tires lost traction once they came into contact with the sand, resulting in his bike sliding into the drainage ditch on the right side of the road. Since that accident, he’s learned to counter steer. He contends that “counter steering” and “muscle memory” would have avoided that earlier accident. I totally disagree, contending that counter steering and muscle memory, even though they’re wonderful skill sets to both acquire and apply, would not provide the traction necessary in safely negotiating that exact same situation. In the meantime, I continue to beg him to slow down on public roads, thereby enabling him to better negotiate the unexpected (unseen hazards on the road and/or animals darting out in front of him). Your thoughts? Without having the benefit of hearing the complete conversation, I would have to say that your friend may have a misunderstanding of countersteering. Countersteering is used to initiate lean by pressing on the handlebar on the side in the direction you want to turn. Press right, lean right, go right. Once lean is initiated, the role of countersteering is pretty much over, except when slight adjustments in lean angle are needed. For example, you would press on the inside handlebar if you needed to tighten your line. And muscle memory is just the ability for your muscles to respond (hopefully in a correct way) to stimuli, which is developed through purposeful and continual practice of the proper techniques so it becomes a habit. If indeed, the cause of the crash was loss of traction on sand, then countersteering did not have a direct role in whether the crash could have been avoided. If what your friend is saying is that countersteering could have helped him swerve around the sand, then yes I would agree that his inability to counter steer did contribute to the crash. But, once a leaning bike rolls over sand or some other traction-robbing surface hazard, then it is often “game over”. The real solution is for your friend to slow down and learn to predict and identify hazardous situations. It is easy to ride beyond the limits of the environment, which means that you can get into trouble even if you are riding well with in your personal limits of motorcycle control. If your friend continues to ride fast on the street, eventually he will be tossed a hazard that even the most proficient rider would not be able to handle. I suggest you buy your friend a track day so he can ride as fast as he dares in a relatively safe environment that is void of sand and other roadway hazards. People who experience the benefits of track day riding often begin to respect the dangers of fast street riding and reserve fast riding to the track. Let’s hope your friend gets the message before it’s too late. And don’t let your daughter ride on the back until he has learned this important lesson. Here’s a question I’ve wondered and was too chicken to try: do you use the swerve movement at highway speed or is that a big no-no? Kathy, my understanding of ‘swerve’ is for emergency avoidance. If you use countersteering for an emergency you will change direction fast, but must countersteer again the other direction almost immediately (hopefully after clearing the obstacle) to prevent going off of the pavement. This takes quite a bit of practice to not crash at highway speed. Start with gentle countersteering going into and out of turns, and in a straight line to experience how handlebar input affects direction change. Countersteering will enable you to precisely place your tire track where you want it. As speed is increased countersteering will require more handlebar pressure to maintain the same line through a corner. Practicing avoidance is best started at low speed in an empty parking lot. Increase speed as you become comfortable with your abilities. An instructional class at a track makes this all very apparent because of the higher speeds. It is money well spent and may save your life! This is somewhat dangerous, but works to undeniably demonstrate the dynamics of countersteering. Have you ever used your LEFT hand on the throttle, maybe to shake out numbness in your right hand? Doing this will make countersteering required to continue in a straight line. I do recommend trying to do this at moderate speed (50 to 60 MPH) for more stability with no traffic and where there is an openness visually. After becoming comfortable with straight line left hand throttle, you may consider progressing to gentle sweeping curves to learn more about countersteering. Doing this the first time will make you think that you may lose control! Maybe it is the left/right brain connection? I know some of you would never advocate this (remember somewhat? dangerous?? ), but it works to experience countersteering. 1 Pings/Trackbacks for "Countersteering Will Save Your Life!"